Dracs, the decisive match to pass on to the next round. The Dracs had to win and then wait and see what happened in the match between the Austrians and the Italians. The match could not have started better for the black and silver team. After several drives with similar results the scoreboard was 15 to 14. The defences were incapable of stopping the attacks. However in the second quarter the Dracs defence still had serious problems an was not capable of stopping the Parma attack, who scored another two touchdowns thanks to the great play of their American receiver. The Dracs’ attack was momentarily stopped. 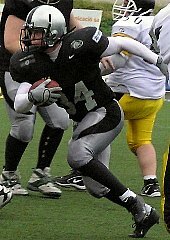 At half time thescore was Dracs 15 – Parma 32. The 17 point difference seemed to be too much---- but the third quarter was a different story. A tremendous defence by the Dracs managed to stop Parma’s attack spectacularly, and pin them back to give a great field position for the offence, which they made good use of scoring two touchdowns. At the end of the third quarter the score was Dracs 30 – Parma 34. The last and decisive quarter offered an opportunity to the Dracs… however a great play on 3rd and 25 left Parma a yard away from scoring another first down.. and they did. In the following play a further pass dropped into the end zone caught by starred wide receiver of the Panthers, Carey Mazza (scorer of 4 TD) and gave the final score of 30 to 41. A great match in the Llefià Stadium of Badalona between two highly motivated teams. Great sensations on the pitch and an optimistic future for the Dracs team. of the LNFA (Spanish Football League).